Right after activating HMWP plugin, you must enter your HMWP purchase code. You can find the purchase code in the order email or Envato dashboard’s Downloads section. 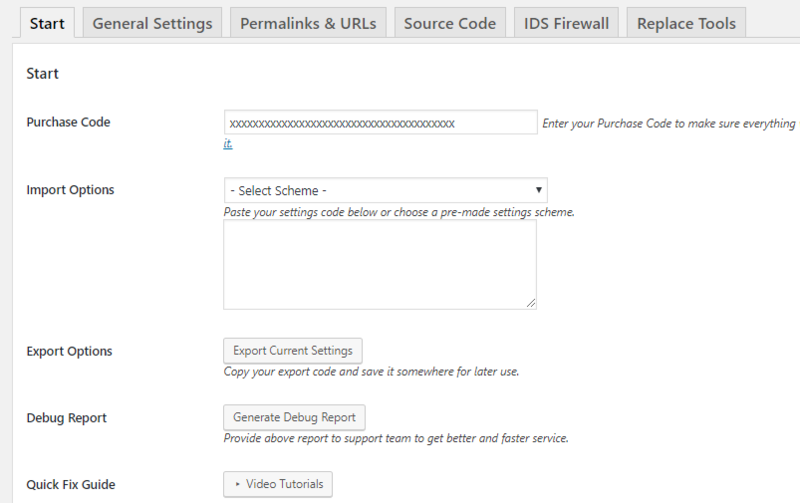 Here, to configure the plugin quickly we have provided number of pre-made settings. You can apply one of these pre-made settings. For example, you can choose ‘Medium Privacy – More Compatibility’ scheme. This section is also used for importing HMWP settings. You’ll need to paste HMWP settings in the provided box and then click on ‘save settings’ button. To export the current HMWP settings, click on ‘export current settings’ button and then save the settings in a text file. Click on ‘generate debug report’ button and provide the generated report to support team to get better and faster service. To restore the previous HMWP settings, click on ‘undo previous settings’ button. Click on ‘Reset Settings to WP’ button to delete all the applied HMWP settings. This is helpful when you want to configure plugin from the start or if there’s any issue while configuring the plugin.